I watched his face as I fell, emotionless, soulless. Not the man I once knew. Not the man I loved. His eyes of ice, regarding me as a lost puppy or burning bush as my legs and arms flailed helplessly through the air, forever lost to the possibilities of what once was. 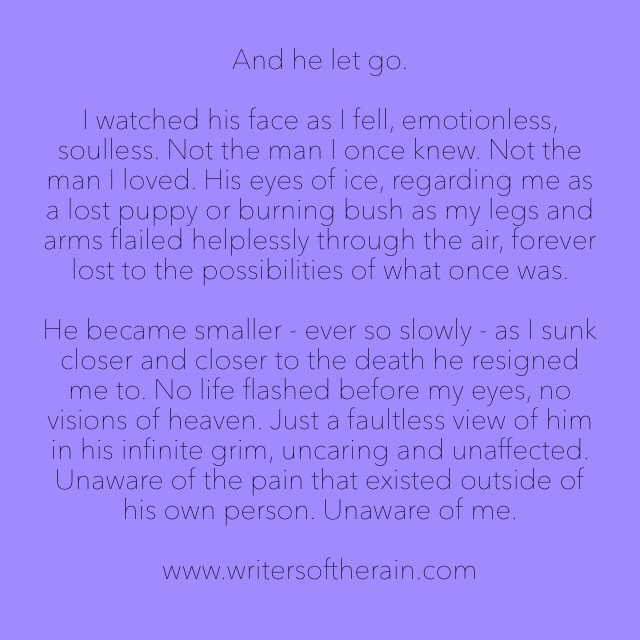 He became smaller – ever so slowly – as I sunk closer and closer to the death he resigned me to. No life flashed before my eyes, no visions of heaven. Just a faultless view of him in his infinite grim, uncaring and unaffected. Unaware of the pain that existed outside of his own person. Unaware of me.